I Quit Sugar Week 7 | FOUR SEASONS OF TRAVEL. This week I am starting week 6 and slowly introducing some artificial and low sugar items back into my diet. I feel like I haven’t been off sugar long enough so am going to try for another week completely sugar free… crazy hey!? I am actually really enjoying not eating any artificial, fake or sugary products, including fruit, even though I LOVE fruit. In the first few weeks I was still having a bit of sugar, so I’m making up for that. Here are some images of what I’ve been eating. So this week hasn’t been so great sugar free wise, having dessert both on Friday and Monday night, but they were special events! Other than than I have followed it fine. Now I am starting to introduce sugar free alternatives like natural sugars and so on that are still fructose free but add a bit of sweetness. I am noticing that I am more sensitive to coconut’s sweetness, and when I had the dessert, I felt like the next morning I had a bit of a sugar hangover, feeling heavy and slightly groggy (even on the night I didn’t drink!). 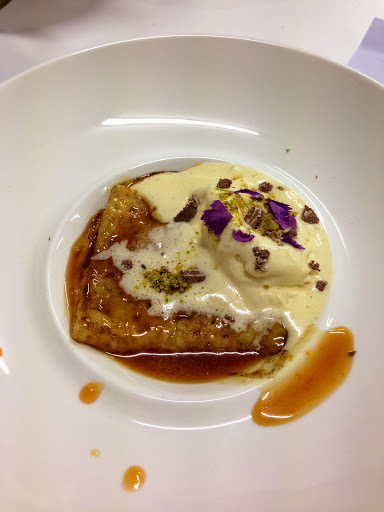 Home made semi-freddo with salted caramel sauce and crepe, 100% worth it! I continually craved sugar, especially after main meals I always felt I needed something sweet to end the meal with. Now I feel satisfied.